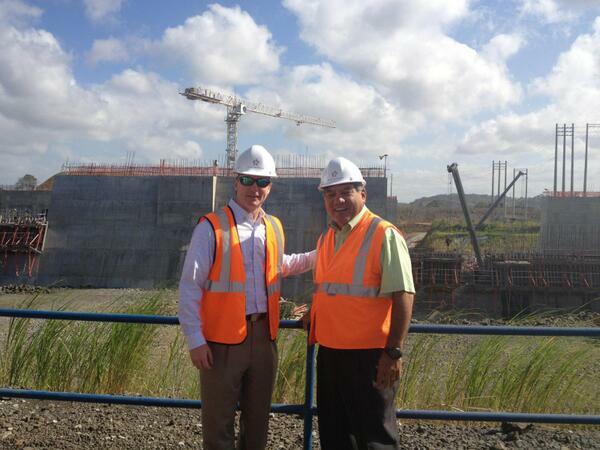 I recently traveled to Panama with a delegation of Floridians with three objectives in mind. First, I wanted to learn about how Florida agriculture can benefit from the current project underway to expand the Panama Canal. Next, Panama is a growing market for fresh, high-quality produce, and there are significant opportunities for Florida agricultural products. Finally, we sought to collaborate with Panamanian officials on efforts to protect our agriculture industries from the threat of pests and disease. The expansion of the Panama Canal is a game changer in global trade logistics. The newly constructed, larger locks will enable post-Panamax ships, with more than double the cargo capacity, to pass through the canal. The use of larger vessels operating at deeper drafts could improve the ability of Florida agricultural products to compete in global markets. Bill Johnson, Director of PortMiami, was part of the delegation and he is working to ensure Florida ports will be prepared to welcome the post-Panamax ships when the expansion is complete in 2015. Also, Florida growers joined us in Panama to promote “Fresh From Florida” products to this growing market for high quality produce. Exports of Florida agricultural products have grown by 70 percent over the last two years, up to more than $168 million in goods. Because of meetings with trade and agriculture officials on the trip, Panamanians will enjoy new Florida produce varieties— never before sold in Panama— as early as Valentine’s Day. With high volumes of international tourists and cargo, Panama and Florida both struggle to protect our agriculture industries from pests and disease. In our meetings with Panamanian officials, we shared our efforts to prevent the introduction of pests and disease by educating international travelers about the threat and urging them to declare agricultural items for inspection. We hope to expand our public awareness campaign to include Panama airports and seaports, and we’re confident this partnership can benefit agriculture industries in both Florida and Panama. I’m excited about the opportunities for Florida in Panama. Not only will the expansion of the Panama Canal enable Florida to share more of its agricultural bounty with others around the world, but the country of Panama itself provides many opportunities for Florida.